Hello, and welcome to our website! We are engineers that provide engineered pole building designs and structural plans for the wood pole barn / wooden pole building industry. Our customers include licensed contractors, owner-builders, farmers, ranchers, home owners, and public agencies. 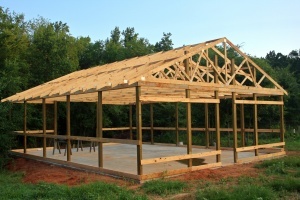 Are you in need of a plan set for a Pole Barn or Pole Building? If so, click here. Are you needing questions answered? If so, click here. We have a nationwide coverage. Our Professionally Licensed Engineers will ensure that your pole building will be safe and designed to resist loads imposed by wind, snow, earthquakes and other natural elements. Our pole barn (pole building) plans are designed to last. They are: accurately designed, safe, and yet economic to build. If you need a pole building designed to meet your specificiations, you may make a request here. If you have questions about our services, please feel free to contact us. Please explore our full range of pole barn and pole building plans and design services and see what we can do for you.